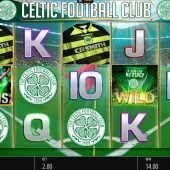 Celtic Football Club slot by Blueprint Gaming brings us a familiar theme based on the famous Scottish football team who were the first British club to lift the European Champions Cup back in 1967, a fact which is celebrated here. It's rare for slots to be centred around one team as football is tribal and it could limit the player base, so previous soccer themes tend to be more generic, like Football Fans, Football Carnival and Football Star. Naturally the background here is Celtic's Park Head stadium with fans cheering you along on every spin, but will it be win, lose or draw for our bankroll? 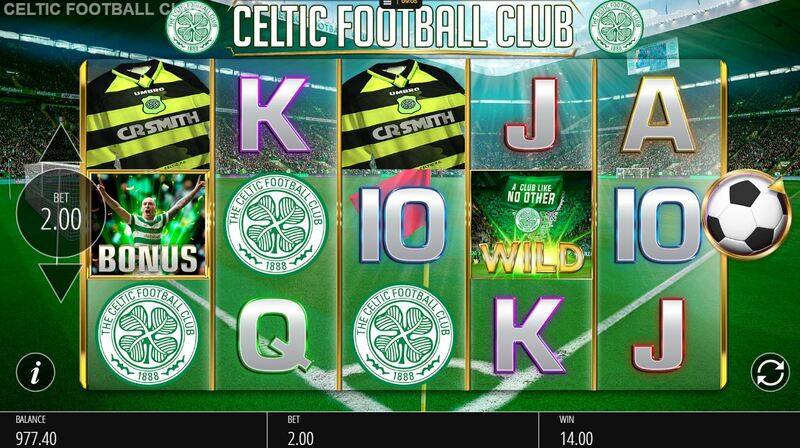 There are 20 fixed paying lines over 5 reels of 3 rows each on Celtic Football Club slot with some symbols stacked. The pays for 5-of-a-kind can be substantial with 5 Wilds paying a staggering 1000x bet, 1967 Star 25x, Club Logo 15x, Home and Away Shirt 12.5x with 5 card values offering either 10 or 5x for a full line. Their famous old striker Henrik Larsson forms the scatter but as usual with Blueprint's 20-liners we have a couple of random modifiers. Like Microgaming's Thunderstruck 2 we get random Wild reels but on up to 4 in this case, so you'll need a natural Wild on the 5th. reel to get that unlikely win of multiple 1000x bet winning lines! You may also see a randomly-triggered feature when the reels darken after a scatter appears on the first. Free Spins - 5 free games with stacked Coins which are mystery symbols and will all reveal the same icon. You can retrigger these 5 spins too. Celtic Way Bonus - you progress round a board picking up cash multipliers and stars, but risking collecting two yellow cards and getting sent off with your prizes gathered. Trophy Room Bonus - pick trophies for cash amounts and collect, or reject and pick again with a maximum of 3 rejections. Mystery Win - a one-off cash amount.